Have UCAS really revealed “the language tricks which will help you land that place at a top university”? UCAS, the agency responsible for admissions to Higher Education in the UK, last week issued an analysis of the personal statements of 300,000 university applicants. They’d totted up the number of ‘passion-related’ words (such as “love” and “explore”) and ‘career-oriented words’ (“salary”, “employable”, “job”, etc.) to see how frequencies differed according to the subjects for which candidates were applying. Journalists seemed unsure what to make of the press release. “In all subjects, applicants used a mixture of career and passion-related words to set out their suitability,” reported The Telegraph. “It’s not a huge surprise,” admitted another report, “that artsy students have cornered the passion market”. One reporter noted aimlessly that “despite the prominence of economics and economists over the last few years, students wanting to major in economics are among those least likely to mention either a ‘career’-related word”. But none of the reports questioned whether such words are actually valued by admissions tutors. This gave the unfortunate impression that all applicants needed to do was use the right vocabulary and their place at university would be secure. The Mirror even promised to reveal “how to strike the balance between ‘passion and purpose’ to NAIL your written application”. My own research into the language of personal statements confirms that Dr Hinds isn’t alone. 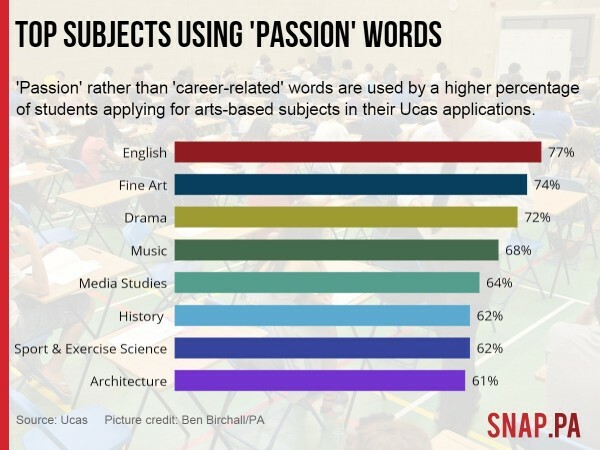 Words like “passion” and “love” are used more by applicants from state schools than those from independent schools, and they correlate negatively with the likelihood of acceptance by higher-prestige universities. The press interest generated by the UCAS study was vacuous (at best) and specious (at worst). A far better use of the large, rich, not-publicly-available database would have been to identify patterns of use according to factors known to affect candidates’ chances of success, such as ethnicity and socio-economic status. This entry was posted in Admissions, Personal Statement and tagged Careers, Ethnicity, Language, socio-economic status, UCAS. Bookmark the permalink.